The Ligurian coast, known as Italia’s ‘Flower Riviera’, will enchant you with its unique coastal and forest trails. It stretches from the French border all the way to Tuscany and offers wooded slopes plunging towards the sea, where fishing villages of tall, sorbet-coloured houses nest in small bays and coves. Fish and seafood dominate the local cuisine, as do rare white wines such as Sciacchetrà. This walking holiday in Italy focuses on the famed Cinque Terre (the ‘Five Lands’), where we offer some great walks along the quiet high trails and the romantic Portovenere. You will walk from village to village, through forests and vineyards and a spectacular terraced landscape overlooking the sea. You will also have the time to visit the historic towns of Levanto, Portofino, Portovenere and of course the five charming villages which make up the ‘Cinque Terre’. The ‘Cinque Terre’’ gets its name from the five picturesque villages of Monterosso, Vernazza, Corniglia, Manarola and Rio Maggiore. The area, now a National Park, is a unique part of Italy. For over a thousand years people have lived in this dramatic landscape, slowly altering its features and cultivating the steep hillsides that lead down to rocky shores. An extensive network of ancient mule tracks – today used as footpaths – takes you through an extraordinary landscape of terraces, built by hand with stones and earth. But the region of Liguria has more to offer: the nearby small towns of Portovenere, and the lively Levanto, a charming medieval town with a broad beach. Of course there is also the famed Peninsula of Portofino, not only known for the colourful Portofino itself, but also for the abbey of San Fruttuoso, located in an isolated inlet of this beautiful coastline, and the lovely Camogli. After settling in your hotel, there is time for a short visit to the town centre and maybe a swim in the sea. Today’s walk takes you along the coast to Monterosso al Mare. The first part of the walk leads up towards Punta Mesco, the most notable promontory in the region. This is a good spot to stop for a picnic lunch. After that you can make a small detour to the ruins of an old 11th century hermitage and the nearby ‘semaforo’ , from where you will enjoy marvellous views of the rugged coastline. Then you follow a fairly steep path down into Monterosso, a colourful village with blue, red & yellow houses that cluster behind the beach-front. You will now have time to explore the town before taking the local train back to Levanto. There is also the option to walk back from here, following an inland forested path, which over the ridge brings you back behind the castle of Levanto. From Levanto you walk in western direction today. The first part of the walk goes along the beach, then the path goes up into the first hills and down to the little seaside village of Bonassola. Then it goes through the seaside hills towards the small settlement of Framura, an aggregation of scattered hamlets on the hillside. From Costa, the highest hamlet, an almost level path contours the hills, with nice views over the sea. A steep descent brings you down to the next village, Deiva Marina (with the option to continue to Moneglia or even to Sestri Levante). This walk along the coast brings you through several charming little villages, where you have the time to drink a coffee, have lunch or just relax. From all the villages on the way you can take the train back to Levanto, in case you want to shorten the walk. You first take the train to Riomaggiore, the most southerly of the five villages, where you can leave your luggage in the hotel. 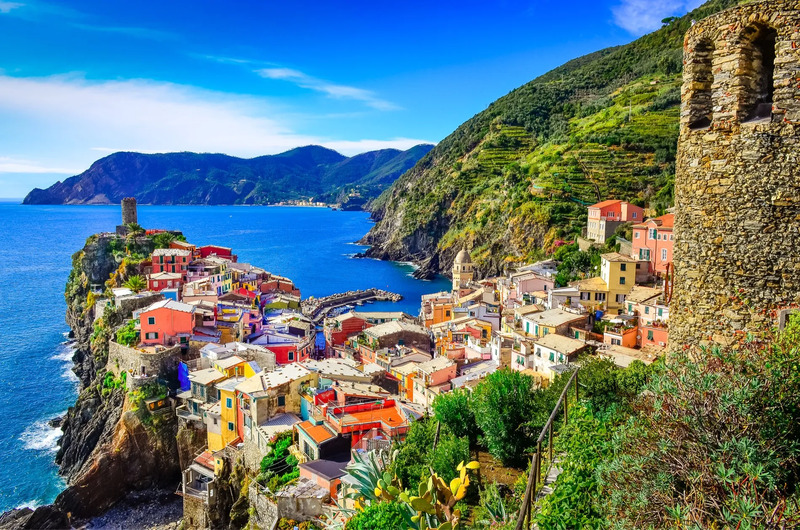 Then you start the most ‘classical’ of all walks in the Cinque Terre: the hike along the famous ‘Sentiero del’Amore’’ (Lovers’ Walk) to Manarola, an attractive little village with tall multi-coloured houses overlooking a rocky port. Then head up the 365 steps to Corniglia, perched on a ridge overlooking the sea. From there you continue through terraced vineyards and the occasional citrus grove. As you approach Vernazza, dominated by its old fortress, you enjoy some of the best views in the region. You contour around the hillsides following a narrow track that leads up and down, before a steep descent brings you into the village itself. In Vernazza, arguably the prettiest of all the villages, there is time to ascend the castle tower for a stunning view of the port with its brightly painted boats. There are numerous cafés and bars where you can enjoy refreshment before taking the train back to your hotel in Riomaggiore. Today you walk in the eastern direction. From Riomaggiore, you commence your walk to Campiglia and Portovenere. You hike up a long flight of stairs to the Santuario della Madonna di Montenero. Continuing uphill you begin contouring along the coastal cliffs, through terraced vineyards, enjoying beautiful views of the coastline framed by clear blue waters. You are now on the ‘Sentiero Rosso’’, the ridge traverse that goes from one end of the Cinque Terre to the other. You pass through the little hamlet of Campiglia where you can stop for some refreshment. Walking down into the pine forest, the track narrows as you continue towards Portovenere with more spectacular views. Arriving at the 16th-century castle above the village, you may be able to see the distant peaks of the Alpi Apuane before a long staircase takes us into the heart of the village. There is time to walk around the beautiful Portovenere and Punta San Pietro, before returning to Riomaggiore by boat. From Riomaggiore, you take the train to Camogli, where you will leave the luggage in your hotel. Then you start your first walk on the Peninsula of Portofino, towards the beautifully located monastery of San Fruttuoso, dating back to the 11th century and set in its own cove and reachable only by boat or on foot. The walk takes you through forested areas, along the church of San Rocco and several impressive viewpoints. From San Fruttuoso there is the possibility to walk back or take a boat. In the afternoon take your time to explore the beautiful Camogli itself. You first make a short transfer by train to Santa Margherita, where you have some time to walk around this attractive town. From Santa Margherita, you then walk to Portofino, a lovely colourful resort village (however it can become overcrowded in July and August). Do visit its castle and lighthouse, a spectacular viewpoint. If energy permits, you can continue along the trail, with splendid views across the Gulf of Genoa to the Abbey of San Fruttuoso, approaching this 11th-century jewel from the other end. You can choose to return by boat to Santa Margherita, or directly to Camogli. After breakfast, you can easily return by train to Levanto (30 minutes), which is well connected to all major cities and airports (Genoa being the closest). 2 and 3-star hotels as indicated in the itinerary. We have carefully hand-picked all places and regularly monitor their quality. We have tried to choose accommodations that offer friendly service, clean and comfortable rooms and local flavour. Nights 1, 2 & 3: These are spent at Levanto, a charming old medieval city, you stay in a welcoming and comfortable 3-star hotel, centrally located at walking distance from all the main monuments of the medieval town centre. Nights 6 & 7: The last two nights are spent in beautiful and lively Santa Margherita Ligure, the gate to the Portofino Peninsula, or in the beautiful small harbour town of Camogli. All breakfasts are included. No evening meals are included, and you are free to choose from the wide choice of restaurants in the area. Your accommodation host can give you good tips. On some occasions, you can also choose to eat at the premises of the hotel. No picnic lunches are included in the tour price, but these can be prepared for you by the accommodation operators, or products for picnics can be purchased in the villages where you stay. On some occasions, you have the option to have your lunch in a restaurant along the way. Our recommended arrival airport for this holiday is Genoa. Other Italian airports are also well connected to Levanto. The tour starts in Levanto. Regular (high speed) trains run between this town and most major Italian cities (Genoa being the closest). Visit the Italia Rail website for up-to-date timetables and fares, or check the rome2rio link below. The tour ends after breakfast in Camogli on Day 8. You can quickly return by train to Levanto (30 minutes), which is well connected to all major cities and airports (Genoa being the closest). Airport transfers by public transport are recommended for this trip, as they are much cheaper and faster compared to car transfers. All internal transfers are by train and not included in trip price; all the villages are well connected by local train services, and you should buy a Cinque Terre Train Card (16 Euro for 24 hours, 29 Euro for two days, 41 Euro for three days). The card allows unlimited train travel on the Levanto – Cinque Terre – La Spezia line (on regional trains in 2° class) and also includes access to all hiking trails, use of ecological park buses, wi-fi internet connection. Hotel to hotel luggage transfers are not included as all your ground transfers are by convenient local trains. You will not have to carry your main luggage while walking, anyway. The reason behind this is that luggage transfers by car are relatively costly here as while by train the distance from village to village is very short (the train shortcuts through tunnels), by car one has to drive a long way around the mountains and often it’s difficult to enter the villages by car, as a special permit is required. This Cinque Terre walking tour which is suitable for those who might have limited experience of walking in the mountains but are in a good general physical condition. High level of fitness is not necessary, but you should be able to walk for up to 5 hours a day in the hot sun on dusty or stony tracks. On some days alternative longer or shorter walks are possible (read more about difficulty grades). Most of the walks are on good paths, some of them just recently restored by the local authorities. Most parts of the trails are waymarked. Elsewhere you have to follow the route notes provided together with the maps. Most paths are relatively well maintained, but during the season some tracks can get overgrown, especially the lesser used paths. We are in continuous contact with local authorities to keep the trails clean – please help us by providing your feedback on the quality of the paths. This trip is available from March until October. Late spring, the whole summer and early autumn are beautiful on the Liguria coast. It may become very hot in July and August, and some of the resort towns – especially Portofino – may become overcrowded in these months, although the trails along the mountain slopes above the coast are far from the tourist rush. Without a doubt the best time to see the Liguria Coast is from April to June, when the spring flowers are in bloom, the weather is just warm enough, and the temperature of the Mediterranean allows for the first dips of the season. The months of September and October are also an excellent time to visit the region, while the temperatures are still mild. We recommend that you travel as light as possible – airlines might charge you an extra fee. As this is a rail & hike holiday, you will transfer all your luggage between hotels by train by yourself. However, the trip is organised in such a way, that you will not have to carry your main luggage while walking. Ideally, you should bring one piece of luggage weighing not more than 25 kg (to be checked in) and a daily pack (15 – 20 l rucksack) for your everyday essentials (snacks, drinking water, camera, etc.). Below is a non-exclusive list of what you should bring to this trip. More detailed info will be included in your holiday information pack. If you need further advice, please contact a reputable outdoor retailer or us. Train fares on walking days. The Cinque Terre Train Card is an affordable and easy to use option (16 Euro for 24 hours, 29 Euro for 2 days, 41 Euro for 3 days). The card allows unlimited train travel on the Levanto – Cinque Terre – La Spezia line (on regional trains in 2° class) and also includes access to all hiking trails, use of ecological park buses, wi-fi internet connection. Today’s walk takes you into the inland of the Cinque Terre, to the churches of Madonna di Reggio and Madonna di Saviore. You first take the train to Vernazza and then walk along the coast to Monterosso, approaching this beautiful little town from the other end. After a coffee break, you start climbing up to the sanctuary of Madonna di Saviore. Here you can have a refreshment or relax for a while, before walking on to the next sanctuary, that of Madonna di Reggio. Then the walk continues along the contour lines; through the hills, you walk to the little church of San Bernardo, with beautiful views over the coast, and from there you descend to the coast at Vernazza again. A shorter option takes you directly from Madonna di Reggio, along a few little chapels, back down to Vernazza. Walking for the day: 4 – 5 hours. The only thing I would say that it was detailed as "easy to moderate" walking. I would say that certain parts of it were very difficult due to terrain. Thankfully my party were all quite fit but even we found parts tricky. Overall great holiday. Last hotel in Camogli was excellent.